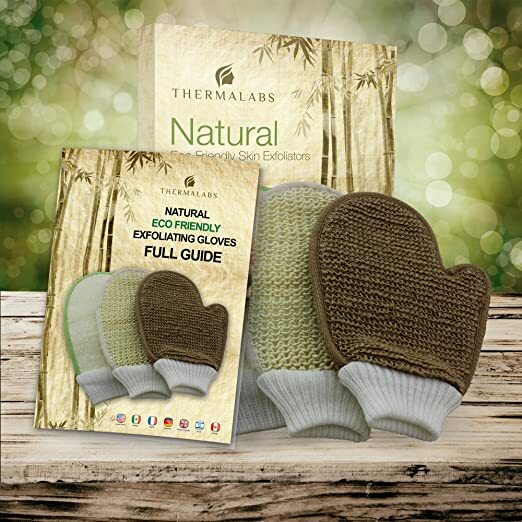 I got this Exfoliating Gloves Set from Thermalabs because I wanted a good quality exfoliating glove and this set came with three different types of these gloves as well as a fingertip exfoliator. The Natural Eco Friendly Body Scrub Exfoliator Pack includes the following: Bamboo Fiber and Loofah, Jute and Sisal Mitts with Printed Guide and Free Finger Exfoliator. I really liked the printed guide that explains each of the gloves and how to use them. This was a nice bonus. I also liked the free finger exfoilator glove. It worked very well on my face while showering. Any of the other gloves would have been too big, and too rough for my face. As for the gloves, they start out pretty stiff so you must make certain to wet them thoroughly or they will probably scratch your skin. After soaking them with water, I applied some of my handmade shower gel to the surface. I tried each of the three gloves, and found that for me the green one worked the best on my skin. I will probably use the other two gloves from time to time, however they weren't quite what I was looking for. They might work well on others though, so I would encourage anyone who bought these to give them a try too.